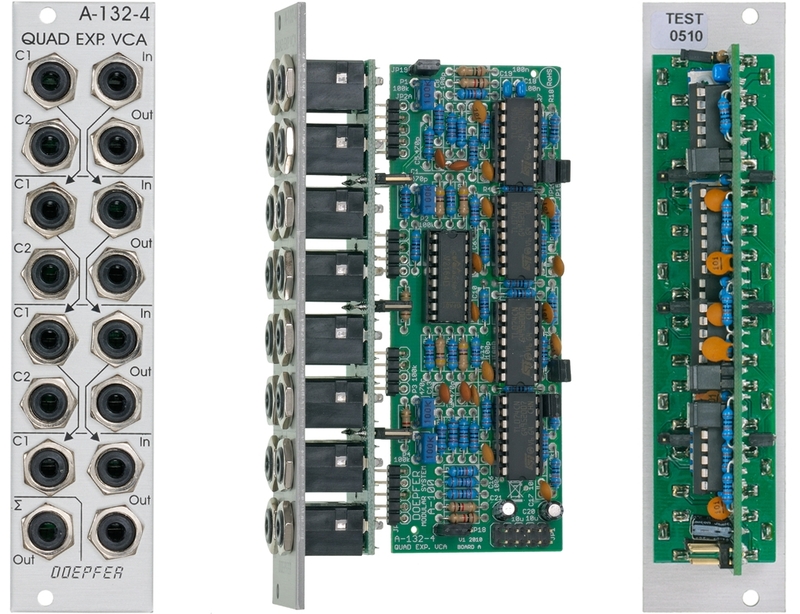 Module A-132-4 contains four identical voltage controlled amplifiers (VCA) with exponential control scales. Each VCA has two control voltage inputs (C1, C2), a signal input (In) and a signal output (Out). The control voltage inputs C1 and the signal inputs can be normalled by means of internal jumpers, i.e. the corresponding input signals of unit #1 can be connected to the switching contacts of unit #2. Those of unit #2 can be normalled to unit #3 and those of unit #3 to unit #4. If the normalling is not desired the jumpers have to be removed. In addition the sum of all four outputs is available (bottom left socket with the sum sign). Therefore unit #4 has only one control voltage input (only C1, no C2). If desired this socket can be jumpered as control voltage input 2. But then the sum signal is no longer available as a socket (only as an internal pin). For each VCA output a jumper is available that determines if the output signal of the corresponding VCA is added to the sum signal. From the factory all four jumpers are set (i.e. all four VCA output signals are added). By removing of one or more of the jumpers one can choose which VCA output is added to the sum. The jumpers can be replaced by switches too. The control scale for each VCA is about 12dB/V (i.e. 1 V CV decrease corresponds to 12dB level decrease and 1 V CV inrease corresponds to 12dB level increase). 0V CV corresponds to about -60dB (i.e. about attenuation by 1000). +5V CV corresponds to about 0dB (i.e. no attenuation or amplification = 1). The full attenuation/amplification range is about -90dB ... + 20dB. Attenuations below -60dB require a negative control voltage, amplifications beyond 0dB require a control voltage more than +5V. For the first CV input of each unit (CV1) an internal trimming potentiometer (attenuator) is available to adjust the control scale for other voltage ranges (e.g. 0...+8V for A-140 envelope control or 0...+10V for external 10V control voltages). To obtain another CV scale even for CV2 an attenuator (e.g. A-183-1) can be used. If an amplification offset is required (e.g. for zero-symmetrical control voltages like LFO) an external offset generator with attenuator/polarizer (e.g. A-183-2) is recommended.